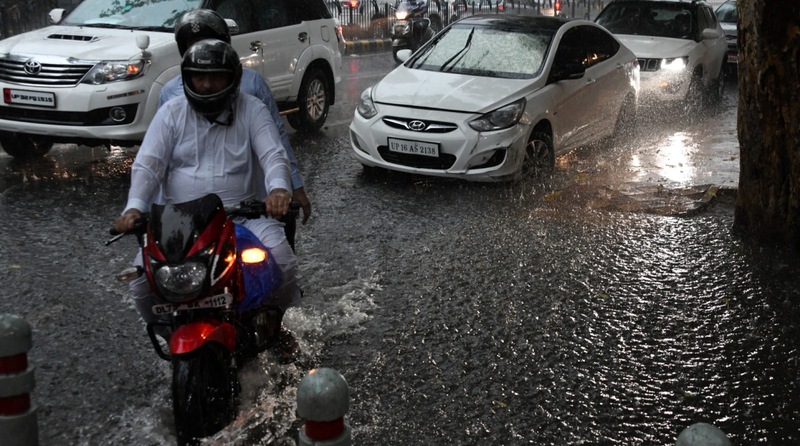 The mercury in the national capital dipped by a few notches as heavy rains lashed New Delhi on Friday afternoon following a slightly long spell of heat and humidity. The mercury in the national capital dipped by a few notches as heavy rains pounded New Delhi on Friday afternoon ending a spell of heat and humidity that had many in the city praying to the rain gods. Though people in Delhi welcomed the showers, traffic jams were witnessed in many parts of the busy city due to waterlogging. Areas such as South Extension, Andrews Ganj and Dhaula Kuan were seen clogged with vehicles. A part of the Delhi Secretariat building was flooded after water started leaking through the roof. A video posted by ANI showed people in the Secretariat avoiding the steady gush of water as it poured through the roof. According to reports, water also poured in on the baggage scan machine at the entrance of the building. While many in Delhi were seen scurrying for cover, some commuters were forced to haggle with auto-rickshaw drivers over increased fares. Fares of cab services reportedly shot up causing inconvenience to daily commuters. The India Meteorological Department (IMD) in its forecast had predicted heavy rains and thundershowers in the capital. 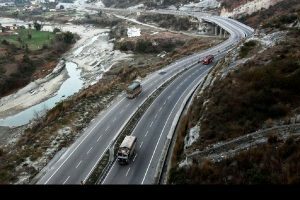 In its weather prediction for 13 July, the IMD said that heavy to very heavy rain with extremely heavy falls were very likely over Gujarat, Goa, Uttarakhand, Rajasthan, Madhya Pradesh, Chhattisgarh, central Maharashtra, Telangana, Karnataka, Kerala, Himachal Pradesh, Punjab, Haryana, Chandigarh and Delhi, West Uttar Pradesh, Vidarbha, Odisha, Andaman and Nicobar Islands, Assam, Meghalaya, Coastal Andhra Pradesh and Tamil Nadu. Rains will continue to batter all the regions for the next few days except western Uttar Pradesh, Haryana, Punjab, Chandigarh and Delhi. A possibility of Mumbai rains making a comeback is not ruled out due to monsoon rain likelihood over Konkan region, Goa and central Maharashtra. The temperature in Delhi at 3 pm was recorded at a maximum of 34 degrees Celsius while the minimum was 28 degrees Celsius. While the maximum temperature in Lucknow was recorded at 29 degrees Celsius, the minimum was 25 degrees Celsius. Phalodi in Jodhpur district of Rajasthan recorded the highest 43.2 degrees Celsius on 12 July.